← Should I change the name of my blog? Not surprisingly, our parenting style has a major impact on our children. 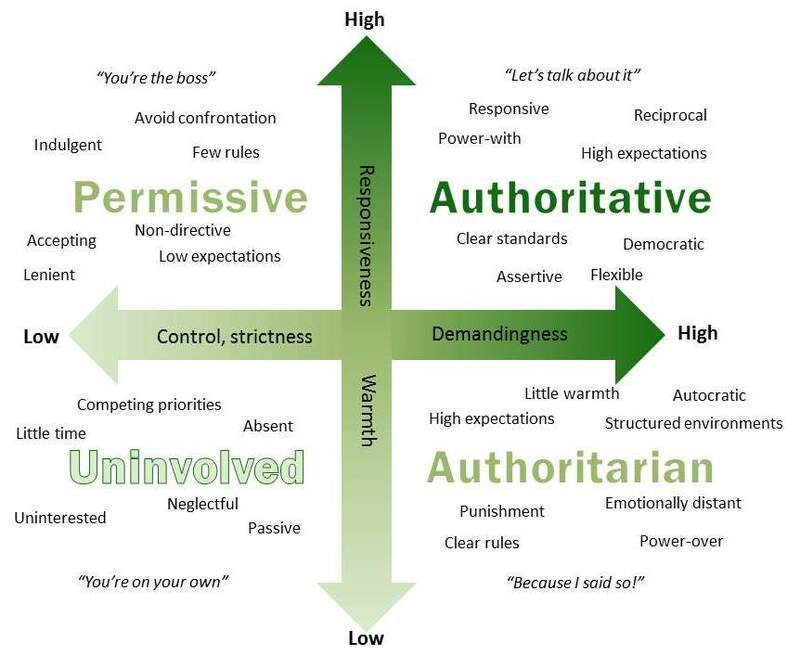 Based on the work of Baumrind [1, 2] and Maccoby and Martin  we often talk about four broad styles: authoritarian, permissive, uninvolved and authoritative. These four parenting styles have been shown to have an important influence on children’s behaviour and wellbeing in the short and long-term [4-7]. The styles are based on a combination of two dimensions: how responsive (or warm) parents are and how demanding and controlling (or strict) they are . According to Baumrind , responsiveness refers to “the extent to which parents intentionally foster individuality and self-assertion by being attuned, supportive, and acquiescent to children’s needs and demands” (p. 410). Demandingness refers to “the claims that parents make on children to become integrated into the family and community by their maturity expectation, supervision, disciplinary efforts, and willingness to confront a disputative child” (p. 411). Authoritarian parents are high on control and demandingness; but low on responsiveness and warmth. They have high expectations of their children, and provide ordered, well-structured and closely monitored environments with clearly stated rules [2-4]. Their demands on their children, however, are not balanced by their responsiveness to the needs and wants of their children. Their children are expected to do as they are told and not to question the authority of the parent because authority is based on age not merit . Authoritarian parents operate from a position of power-over rather than a position of power-with. Although children benefit from rules and boundaries, authoritarian parenting is frequently “too punitive and lacks the warmth, unconditional love and nurturing that children need” (About Education). Authoritarian parents expect to be obeyed, rules are not discussed in advance and there is little negotiation between parents and children. As Maccoby and Martin  suggest, authoritative parents “attach strong value to the maintenance of their authority, and suppress any efforts their children make to challenge it” (pp. 39-40). Disobedience is likely to lead to punishment. Permissive parents are high on responsiveness and warmth; but low on control and demandingness. They generally avoid confrontation, asserting their authority or imposing limitations on their children, and allow their children to regulate their own behaviour [2-4]. Children can make many decisions for themselves and there are few rules. Permissive parents try to be accepting and affirmative, and are tolerant of their children’s impulses, desires and actions  and value self-expression rather than conforming to societal expectations. Permissive parents try to be loving and nurturing, have fairly low expectations in terms of maturity and self-control, and see themselves more as a friends than a parent (About Education). Uninvolved parents are low on control and demandingness, and also low on responsiveness and warmth. Although, in extreme cases, uninvolved parents are neglectful or reject their children , more commonly they provide for the basic needs of their children but their main focus is on other aspects of their lives (e.g., work or substance use) and so have little time or energy for their children . They place few expectations on their children, are unlikely to be involved in their children’s lives (e.g., attending school events) and offer little or no supervision (About Education). They may be focused on their career or earning an income, not recognise that they are uninvolved with their children, be unable to provide emotional support or simply find it easier to take a hands-off approach to raising their children. Authoritative parents are high on control and demandingness, and also high on responsiveness and warmth. They set clear standards for their children but accept “a reciprocal responsibility to be as responsive as possible to their children’s reasonable demands and points of views” [3, p. 46]. 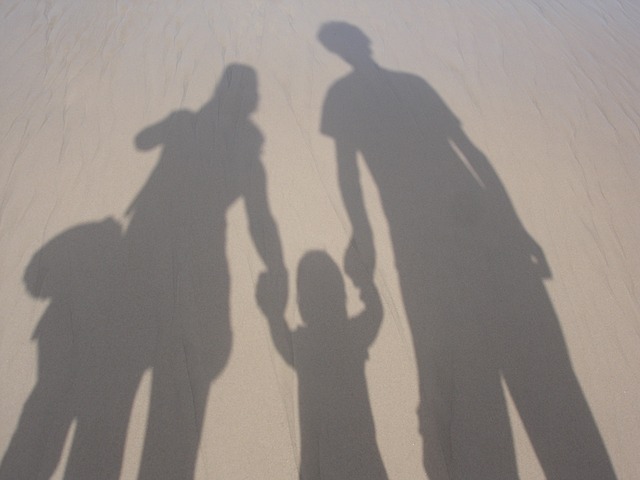 The authoritative style of parenting can be described as democratic with parents being willing to discuss options and to negotiate rules and expectations. When children fail to meet these expectations, the parents respond in a nurturing and forgiving way rather than simply imposing punishment (About Education). Monitor and impart clear standards for their children’s conduct. They are assertive, but not intrusive and restrictive. Their disciplinary methods are supportive, rather than punitive. They want their children to be assertive as well as socially responsible, and self-regulated as well as cooperative (p. 62). While these typologies do have their uses, we also have to remember that they are a static, simple representation of a complex issue. How we parent needs to be child-centred – it needs to suit the child. We need to be able to adapt to the child and the situation. Hopefully parents are responsive to things like their children’s personality and age, the context and the seriousness of the situation. Parents also need to be able to adapt to the changing developmental needs of their children . It is important to remember that parents are more than their parenting style and we need to be careful about using their representations as labels, particularly if they lead to us being judgemental of others. Do you find these parenting styles a useful way of thinking about parenting? Do they fit in with your experience of parenting, being parented or seeing how others parent? When is it OK for kids to walk home alone? Baumrind, D., Effects of authoritative parental control on child behavior. Child Development, 1966. 37(4): p. 887. Baumrind, D., The Influence of Parenting Style on Adolescent Competence and Substance Use. The Journal of Early Adolescence, 1991. 11(1): p. 56-95. Maccoby, E. and J. Martin, Socialization, personality and social development, in Handbook of child psychology: , P.H. Mussen and J. Hetherington, Editors. 1983, Wiley: New York. Darling, N., Parenting Style and Its Correlates. ERIC Digest. 1999. p. 3. Petito, F. and R.A. Cummins, Quality of life in adolescence: The role of perceived control, parenting style, and social support. Behaviour Change, 2000. 17(3): p. 196. Piko, B.F. and M.Á. Balázs, Control or involvement? Relationship between authoritative parenting style and adolescent depressive symptomatology. European Child & Adolescent Psychiatry, 2012. 21(3): p. 149-55. Williams, K.E., J. Ciarrochi, and P.C. Heaven, Inflexible Parents, Inflexible Kids: A 6-Year Longitudinal Study of Parenting Style and the Development of Psychological Flexibility in Adolescents. Journal of Youth and Adolescence, 2012. 41(8): p. 1053-66. García, F. and E. Gracia, Is always authoritative the optimum parenting style? Evidence from Spanish families. Adolescence, 2009. 44(173): p. 101-31. Baumrind, D., The discipline controversy revisited. Family Relations, 1996. 45(4): p. 405. Grille, R., Parenting for a peaceful world. 2nd ed. 2013, Avlon Beach, N.S.W. : New Society Publishers. xix, 428 p.
Millings, A., et al., Good Partner, Good Parent: Responsiveness Mediates the Link Between Romantic Attachment and Parenting Style. Personality & Social Psychology Bulletin, 2013. 39(2): p. 170-180. Ballantine, J., Raising competent kids: The authoritative parenting style. Childhood Education, 2001. 78(1): p. 46-47. Nelson, L.J., et al., Parenting in Emerging Adulthood: An Examination of Parenting Clusters and Correlates. Journal of Youth and Adolescence, 2011. 40(6): p. 730-43. Maccoby, E.E., The Role of Parents in the Socialization of Children: An Historical Overview. Developmental Psychology, 1992. 28(6): p. 1006-1017. This entry was posted in Families & parenting and tagged Authoritative, Children, Discipline, For students, Parenting styles, Parents, What is. Bookmark the permalink. 6 Responses to What are authoritarian, permissive, uninvolved and authoritative parenting styles? Thanks Graeme this is great information. I invite you to have a look at the work of Dr Joan Durrant – Manitoba University who has written about Positive Discipline in Everyday Parenting – the book is free to download. Discipline means to teach – and children need to be taught with warmth and structure. This is an exciting parent training model that is relationship rather than behaviourist based, that values individual uniqueness and parents as the experts in their own lives and the lives of their children. And congratulations on the 400th post – love them! Thanks Marie. I’ll have a look at the book it sounds interesting. If anybody else is interested it is available from http://www.frp.ca/index.cfm?fuseaction=Page.ViewPage&PageID=1122 (and there are some interviews with her too). This is a great post and I loved all the information in it. I especially loved the quiz and the outcome :-) Thanks for that! Yes, I liked the quiz too. I looked at quite a few others but thought this was the best. Just realised this is my 400th post!